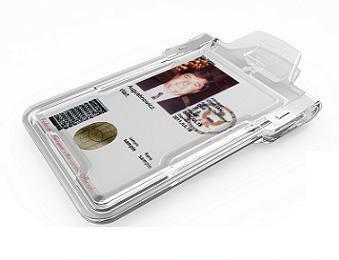 Secure Badgeholder Classic with BloxProx - Maintains all the benefits of the Classic while also providing protection for HID Proximity 125Khz Access and ID cards. Before now, blocking HID Proximity 125Khz was almost impossible. 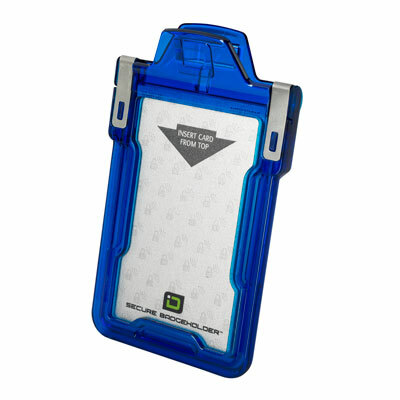 But now with Classic with BloxProx, 125Khz HID Proximity card read range can be reduced to a required 'touch' for a read. * Secure your buildings now, protect your employees, plans, and inventories from smart industrial thieves or disgruntled employees. Click here for the investigative report. If your access card 'feels' thicker than a regular credit card, and has beveled edges, you may have a 'clam shell' access card. Call for details on how to protect that card. The Secure Badgeholder Classic is designed to hold and shield one card. Our Squeeze to Read™ technology allows the card to be read by simply squeezing the tabs at the top. Release the tabs and the card is shielded again. Perfect when your hands are full, or when you are wearing gloves! Our Secure Badgeholders are made of extremely durable polycarbonate. The springs are stainless steel, ideal for salt-water environments. Insert and remove your card from the top. The state of the art unique open face design keeps the card locked-in to prevent loss, yet allows easy access to remove the card when neccessary. Other holders on the market cover the face of the card keeping debris and liquid trapped inside, which can damage the card. Don't risk identity theft, invasion of privacy, tracking, or even card cloning. Always keep your contactless cards in a shielded Secure Badgeholder. It provides a barrier to invasive or unwanted communications with the card and puts the user in control of where and when the card is read. Larger quantities with discounted pricing are available by special order. Distributors, Government Agencies and Resellers welcome. Government sales available on GSA Schedule 70. Call 1.800.610.2770 for details. * 125Khz cards are incredibly hard to block due to their low frequency range. Our new technology will provide protection in almost every daily use of the card and badgeholders. If the card and badge holder in its protective position, were presented to a reader, and held 'on the reader' for an extended period of time, a read MAY be made, but the likelihood is slim. However, readers vary greatly and there may be a stray occurrence with extended presentation to the reader, even in the optimum protective state.